Stephanie Tubbs Jones won election to the U.S. House of Representatives in 1998, becoming the first African–American woman to represent Ohio in the U.S. Congress. In the 110th Congress (2007–2009), Jones became the first African–American woman to chair a standing House committee.1 Representative Jones, who chaired the Standards of Official Conduct Committee and held a seat on the influential Ways and Means Committee, focused on the economic issues affecting her Cleveland–centered district: financial literacy, access to health care, retirement security, and education. Representative Jones’s district encompassed some of Cleveland’s most affluent suburbs and parts of poor, inner–city neighborhoods. Her seat on Financial Services helped her secure funding for business and housing development. In the 108th Congress, Jones chaired the Congressional Black Caucus Housing Task Force, investigating allegations against subprime lenders and introducing legislation against predatory lenders.8 Jones’s seat on Ways and Means enabled her to focus legislative efforts on shoring up Social Security and Medicare, pension law, and long–term care. Jones also took a legislative interest in children’s issues, health, and education. She authored and passed the Child Abuse prevention and enforcement Act of 1999 to increase training funds for child–protection workers through money generated from bail bonds, fines, and forfeited assets. 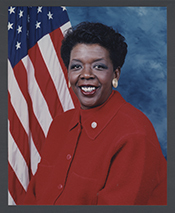 In the 107th through the 109th Congresses (2001–2007), Representative Jones introduced the Uterine Fibroids Research and Education Act and also authored the Campus Fire Prevention Act to provide federal funds to equip college housing with fire suppression equipment. In 2005, Jones introduced the Count Every Vote Act to improve electronic voting systems. Additionally, she authored legislation to clarify the legal status of cash balance pension plans. In the 109th Congress, she chaired the Congressional Black Caucus Retirement Security Task Force. Representative Jones died suddenly of a brain aneurism on August 20, 2008. She was succeeded by Marcia L. Fudge—one of her former aides and the mayor of Warrensville Heights, Ohio—in a special election on November 18, 2008. 1Representative Juanita Millender–McDonald of California became Chairwoman of the House Administration Committee at the same time. 2Richard Fenno, Going Home: Black Representatives and Their Constituents (Chicago: University of Chicago Press, 2003): 193. 3“Stephanie Tubbs Jones,” Contemporary Black Biography, volume 24 (Detroit, MI: Gale Research Inc., 2000). 4Fenno, Going Home: 196–198; 201. 6“Election Statistics, 1920 to Present,” available at http://clerk.house.gov/member_info/electionInfo/index.aspx. 7Politics in America, 2008 (Washington, DC: Congressional Quarterly Inc., 2007): 800. 8Politics in America, 2002 (Washington, DC: Congressional Quarterly Inc., 2001): 796–797. Videocassette: 1990, 1 commercial on 1 videocassette. The commercial was used during Stephanie Tubbs Jones's campaign for the 1990 state supreme court justice election in Ohio. "Stephanie Tubbs Jones" in Black Americans in Congress, 1870-2007. Prepared under the direction of the Committee on House Administration by the Office of History & Preservation, U. S. House of Representatives. Washington: Government Printing Office, 2008. "Stephanie Tubbs Jones" in Women in Congress, 1917-2006. Prepared under the direction of the Committee on House Administration by the Office of History & Preservation, U. S. House of Representatives. Washington: Government Printing Office, 2006.